The BRACED Knowledge Manager (made up of a consortium of partners, including Itad) is concerned with generating and understanding evidence on how the BRACED programme is building the resilience of its stakeholders to climate-related extremes and disasters. To do this we need to monitor, measure and interpret the changes being brought about by the programme. The BRACED programme is made up of a number of components, including 15 country-level resilience building projects in West Africa, East Africa and Asia. The BRACED Knowledge Manager has developed a monitoring and evaluation (M&E) framework which the 15 BRACED projects contribute to. This enables us to conduct analysis at the programme level and to test an approach to monitoring and measuring changes in resilience brought about by different interventions in multiple contexts. 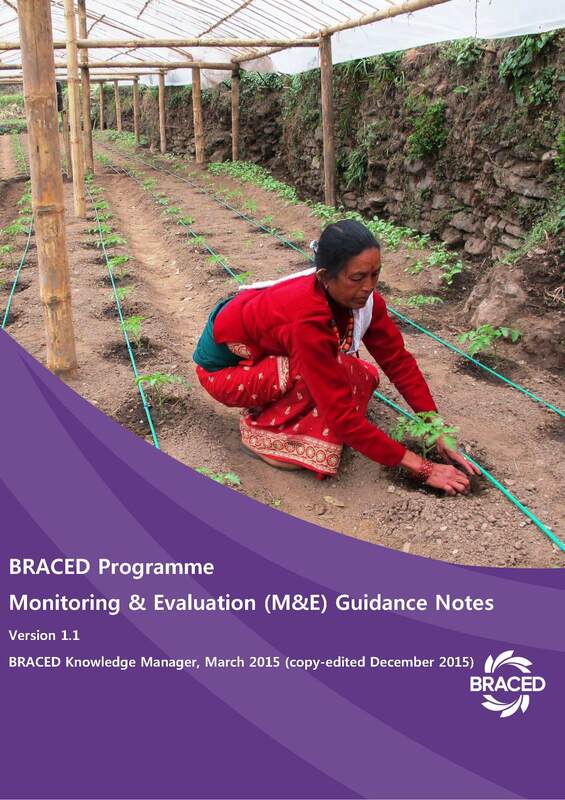 The BRACED M&E Guidance Notes set out the BRACED M&E framework itself and the guidance provided to the 15 country-level project Implementing Partners during the first year of the programme. Both the Knowledge Manager and Implementing Partners themselves are learning through the practical application of the framework and guidance. The Knowledge Manager will be documenting learning and updating the guidance based on experiences throughout the programme.